8 year/s ago 1460 Visit WebsiteTransportationBroken link? 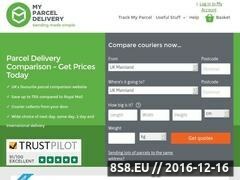 Compare, Send and Save with myParcelDelivery.com - the online Courier Services Comparison site. From next day to eBay shipping, we will find the best courier services for your business. Sorry, BrowseInter.net Website Directory does not contain yet any other websites related to courier services, parcel delivery or courier service!